EquiGym’s most popular model, the 6-horse, keeps the diameter of the banked outer circle large enough at 68’2” to enable the machine to be utilized as a conditioning tool for walking, jogging and galloping horses. 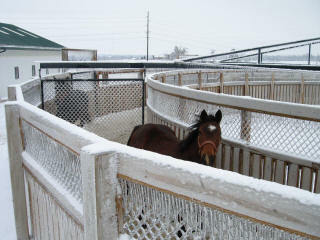 There is a comfortable 32 feet in-between the moving gates and 8 feet in-between the fences. Each gate is double hinged at the top and is wired to a livestock electric fence charger that can be energized manually, at the control box with an illuminated switch, as needed to train the horses to leave the gates alone. Since EquiGym is both the designer and manufacturer of the equipment, we can custom manufacture equipment for special sizes and needs. 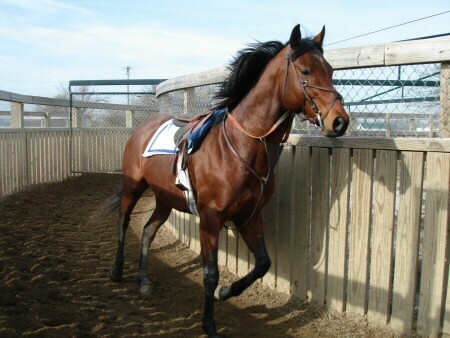 The Horse Exerciser goes quietly from 0 to 20 miles per hour in two directions. It uses 220-volt, single-phase power, either 60 or 50 Hz. The electric fence charger uses 110-volt, single-phase power. The only maintenance required is to grease the two bearings that hold the shaft, once or twice per year, depending on the frequency of use. At EquiGym, we’ve determined that the majority of horses need between 30 to 33 feet of space in-between the moving gates in order to exercise comfortably. 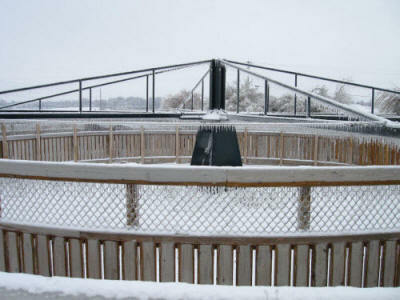 This will dictate the number of horses that can exercise at one time within the diameter allocated for the machine. Horses can travel safely, in a tight turn at most speeds as long as the outer fence is banked and the surface and fencing stays solidly in place. Weight - approximately 3,700 pounds for a six horse model. Speed Potentiometer to control the speeds. Speeds - 0 to 20 miles per hour. Control Readout - speed in miles per hour. 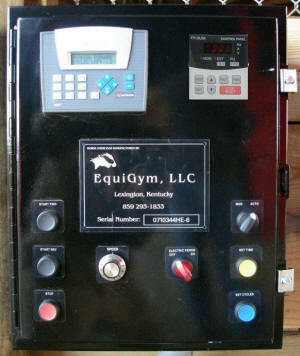 Electric Fence Charger is controlled with an illuminated switch placed on the front of the control box. Drive - Mitsubishi Inverter, 5 hp. Gear Motor - Nord, 2 hp. Direct Drive, inline with center shaft. Maintenance, grease two bearings holding the center shaft. 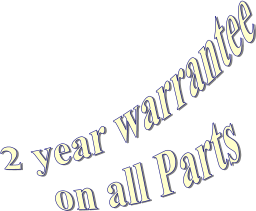 Warrantee, 2 years on all parts. EquiGym will provide Concrete Pad Plans, which also include the Electrical Plans for the base, control box and the disconnect. Grading and Drainage Plans, Fencing Dimension sheet, plus two types of Fence Construction Plans with material lists. A simple forward, reverse, stop switch, speed dial and an electric fence off/on switch. The speed of the machine is displayed in miles per hour on the keypad. The direction of the machine can be switched at any speed without stopping the machine in-between switching. Just switch from forward directly to reverse. 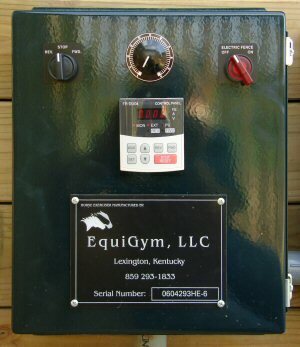 A simple to use, automatic/manual control for the Horse Exerciser. In Manual it will run just like the Standard Control Box. In Automatic it can be programmed to cycle through a set number of forward and reverse cycles and a set number of timed cycles and execute the above at any speed set on the speed dial. When finished with cycles, it will default to a walk speed. There can be an optional beacon light added that is placed in the barn to signal that the machine is finished with all of its cycles and is walking the horses. We trained today, did you?